Learning Resources always has wonderful toy selections for the kids. They make the kind of toys that allow children to learn and grow without them even realizing they are doing so. To them, it's just having fun...and isn't that a wonderful way to teach? The Matching Dinos they sell are no exception. Kids learn to color-coordinate by snapping the right pieces and parts together on these chunky, hand-sized and adorable dinos. These are going to my nephew for Christmas. He's going to love that they came in their own carrying case. He's also going to love that they fit into his sweet little hands just right. I can see him walking around the living room with them now! Some things you get and you just know they're going to be a hit. I love that they're bold and colorful, and that there are different types of dinos to further help with the teaching too. Learning Resources has done it again, making a high quality, fun item the kids are going to enjoy. Learn more by visiting Learning Resources where you will find so many great ideas for play and learning (I've got my eye on the Pretend and Play Teaching ATM Bank in Pink). You can also pick these up at Bed Bath & Beyond! Make playtime fun and educational for your child with the Snap-n-Learn Matching Dinos from Learning Resources. 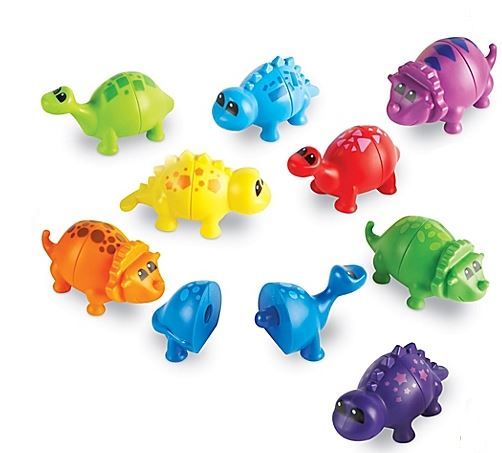 From mixing and matching each color-coded dinosaur, your little one will learn shapes, color coordination, and more.